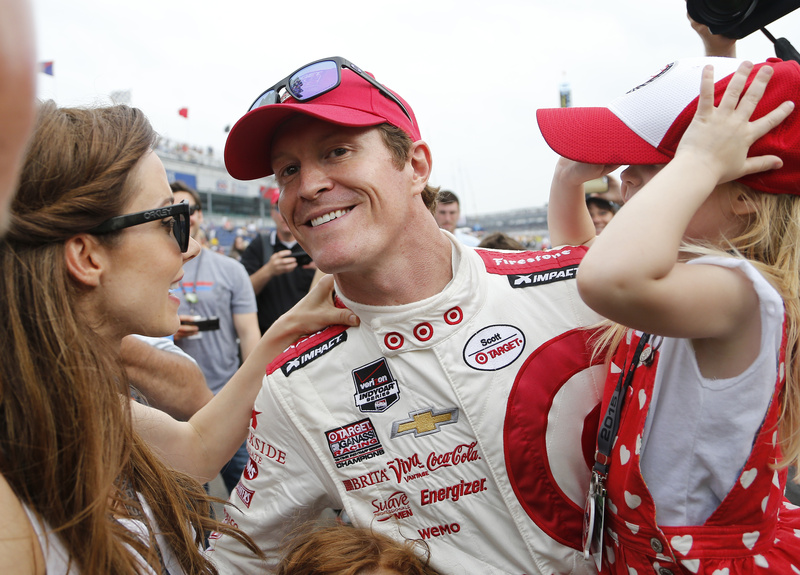 INDIANAPOLIS – One minute, Scott Dixon thought the numbers were a mistake. On one of the strangest qualifying days in Indy history, Dixon overcame rules changes, a revised schedule, the threat of rain and Team Penske’s powerful four-car lineup to earn his second Indy pole with a four-lap average of 226.760 mph. But when Ed Carpenter’s primary car went airborne in the morning practice, the third Chevrolet car to do that this week, team owners, engine manufacturers and series officials huddled in Gasoline Alley to find a solution. They settled on removing the extra horsepower for qualifying and instructed all teams to use race setups, a combination that sent 34 drivers trying to make the race scrambling. The five-hour, 15-minute delay forced everyone to scramble. Despite the steep drop in speeds, Dixon somehow had enough to move into the top spot 25 minutes into qualifying, then hung on as 29 other drivers took shots at knocking him down a notch on the 33-car starting grid. None could. His winning average was more than 4 mph slower than last year’s pole-winning speed and almost 7 mph slower than the fastest laps turned this month. Power’s dream of a May sweep – winning both poles and both races at Indy – ended when the Australian couldn’t catch Dixon. Three-time Indy champ Helio Castroneves thought he had a shot at a fifth Indy pole but never topped 226 and will start fifth, the middle of Row 2 after averaging 225.502. The Brazilian was trying to break a tie with A.J. Foyt and Rex Mays for the second-most Indy poles behind Rick Mears (six). Carpenter’s crash ended his quest at becoming the first driver to win three straight poles at Indy. The delay did give his team time, however, to get a backup car ready and he wound up in the No. 12 starting spot after going 224.883. He was the third car out and held the top spot for a few minutes, until Dixon, the fourth driver in qualifying line, finished his run. Because the revised schedule gave each car only one shot at the pole, Dixon didn’t even have to worry about anybody getting a second chance. And some of the Honda drivers were understandably upset with the changes. Chevy took eight of the first 10 starting spots with the top Honda driver being England’s Justin Wilson. He will start sixth, the outside of Row 2, after going 225.279. Defending champion Ryan Hunter-Reay was the second car out and will start on the inside of Row 6 after posting a 224.573.